Our first State Ambassadors!!! 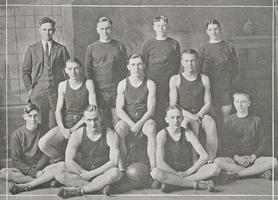 The 1924-25 basketball squad was the first team to represent Tomahawk on the State level. Tomahawk was part of the Valley Conference and played against the likes of Shawano, Medford, Rhinelander, Wausau, Stevens Point, Wisconsin Rapids, Merrill, Antigo, Marshfield, and Nekoosa. This very special team started the season off with two losses before winning 12 straight contests sending them to the Big Dance where they were defeated 24-8 by state champion LaCrosse and 20-18 by Manitowoc in the consolation bracket. The 12-4 season under the direction of head coach Robert Webster was remarkable and memorable for our entire community. Team members Ambrose Smith, Ted Chvala, Carl Ecklund, Eugene Brady, Frederick Cull, Sylvester Polege, John Robarge, George Larson, Paul Bebeau, Maurice Nickel, Richard Nilsen, Albert Marcouiller, and Laurence Foster were lead by All-Conference selection John "Cappy" Smith. Season results were a 24-21 loss to Wausau (Cappy Smith scored 15 points) and a 14-8 loss to Marshfield (the bus broke down so the team had to travel the last seven miles by sleigh to Marshfield not arriving until 9:30 pm) and then reeling off 12 straight victories. This victory streak included a 16-15 win over Wausau, 19-8 over Merrill, 15-4 over Rhinelander, 17-14 over Wisconsin Rapids, 12-9 over Nekoosa (the wins over Wisconsin Rapids and Nekoosa were the direct result of Coach Webster having his team play a man to man defense instead of a zone), 16-15 over Merrill, 54-7 over Minocqua, 22-10 over Rhinelander, and 20-19 over Medford. Late in the Medford game, Tomahawk led 19-17 and the wrong man from Medford called a time out, as only the captain could call an official timeout, and Tomahawk sank a free-throw as a result of the technical called on Medford. This victory meant that Tomahawk would not blow a 17-8 lead before starting the playoffs. Coach Webster was taking no chances in their first playoff game as he had the team carry their own water and they had little trouble defeating Eagle River 15-10. This victory put Tomahawk into the Sectionals and Coach Webster mandated 16 hours of sleep before their upcoming contests. With plenty of rest for Sectionals, Tomahawk wasted little time in defeating Medford 19-12 before thrashing Antigo 19-6 to become Sectional Champions and earn the right to be in the State tournament. Solid playoff action also meant that Cappy Smith would receive All-Star Team honors from the coaches and sports writers. Two losses at State was not how the team wanted to end their special season but their efforts were an inspiration to many members of our community.